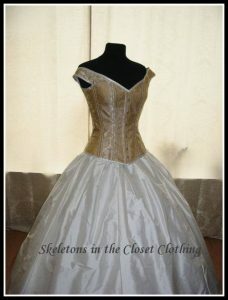 Skeletons in the Closet also makes custom bridal gowns. For the brides that who want to have a one of a kind gown, or for brides who just can not find the gown they dream of in a regular store. Custom bridal gowns are usually ordered at least 6 months in advance, and you either need an in person fitting or a long distance toile fitting. Here are some examples of wedding gowns we made in the past, or gowns that could have been worn at a wedding. This fantasy style gown was not made for a wedding but would have been great for one. The combination of deep red and cream is royal and makes a lasting impression. A gold and ivory dream. Brocade overbust corset with a silk skirt. Please do not be scared to contact me for your dream wedding gown. Altough custom made couture is not cheap it also does not have to break the bank. 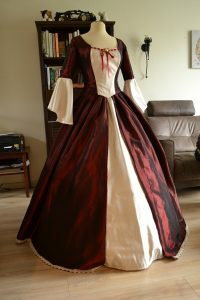 For example a wedding gown consisting out of: Custom made (incl mock-up) silk corset, Ball gown skirt with lining and hand finshed hem and a hoop underskirt can start at 1200 euro’s. It becomes more expensive if you wish to add hand cut French lace stitched by hand on the corset, or a large cathedral train or silk flowers, or layers and layers of bridal tule.